In recent years, federal mandates in education have become the subject of increasing debate. 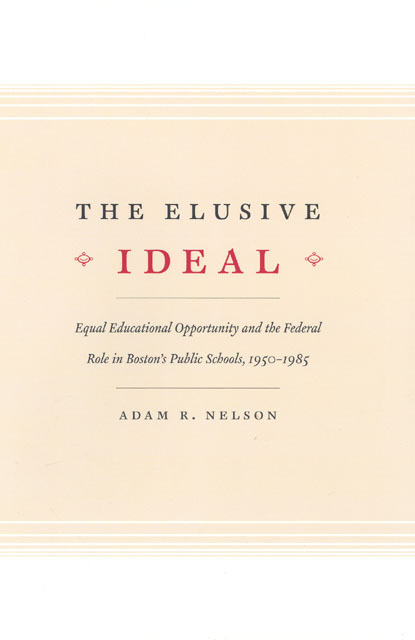 Adam R. Nelson’s The Elusive Ideal—a postwar history of federal involvement in the Boston public schools—provides lessons from the past that shed light on the continuing struggles of urban public schools today. This far-reaching analysis examines the persistent failure of educational policy at local, state, and federal levels to equalize educational opportunity for all. Exploring deep-seated tensions between the educational ideals of integration, inclusion, and academic achievement over time, Nelson considers the development and implementation of policies targeted at diverse groups of urban students, including policies related to racial desegregation, bilingual education, special education, school funding, and standardized testing. An ambitious study that spans more than thirty years and covers all facets of educational policy, from legal battles to tax strategies, The Elusive Ideal provides a model from which future inquiries will proceed. A probing and provocative work of urban history with deep relevance for urban public schools today, Nelson’s book reveals why equal educational opportunity remains such an elusive ideal. "Nelson is breaking new ground by comparing different equity reforms in education against the background of local / federal relations. Historians of education and policy analysts will find The Elusive Ideal very illuminating." "The Elusive Ideal is a first-rate, important contribution to our understanding of cities and education practices and policies in the recent past. It presents an original interpretation of the interaction of different definitions and proposed solutions for providing equal education opportunities. Well-organized and clearly written, this book will appeal to a broad audience." "Packed with insight and carefully grounded in a meticulous understanding for both detail and institutional interaction, Adam Nelson demonstrates how the half-century goals of integrated education and student achievement operated at cross-purposes in the Boston public schools. Federal mandates that were designed to support the goals only made the problems worse and confused the issues. Nelson is wisely nonjudgmental, but he raises troubling questions that no proponent of equal educational opportunity can afford to ignore." "The Elusive Ideal provides much-needed context for understanding the events in Boston and, in so doing, provides a usefuol history of federal education policy. . . . A well-researched history of the evolution of policies for and approaches to educating children with special educational needs. Although the book concentrates on Boston’s story, its lessons are more general. It will be of great interest to historians and economists who study the development and effects of educational policy in the United States." "By tapping a broad array of sources, especially legislation, educational reports, and newspaper articles, [Nelson] ably uses the history of federal aid to the Boston public schools as a means of probing the complex interplay between school integation and student achievement. . . . Thorough and well-researched. It makes a valuable contribution to the fields of both history and educational policy, specifically because it pulls so many ideas together in a new way." "Every once in a while, a book comes along that not only makes a significant contribution to the literature but also enlarges the playing field on which future discussions of the issues will take place. Such is the import of . . . [Nelson’s] timely study. . . . What emerges from Nelson’s book is a sophisticated understanding of the complexities of urban school reform and a deep appreciation of the various obstacles that stand in the way."